teeth,out of this,One individual had three drilled teeth,while another had a tooth that had been drilled twice.All 9 of the Mehrgarh dental patients were adults-4 females, 2 males, and 3 individuals of unknown gender-and ranged in age from about 20 to over 40.A closer look with a microscope revealed that at least in one case,not only had the tooth been drilled,but the resulting cavity had also been delicately reshaped.To make a hole on the relatively small surface of a tooth,Mehrgarh's dentists probably used a contraption quite similar to the one used in making a fire.Rope from a bow like device was looped around a slender piece of wood that was tipped with a sharp shard of flint.When the bow was moved sideways,it created a drill-like circular motion and pushed the flint into the tooth.The researchers think that know-how for the early dentistry was probably transferred from artisans skilled at drilling holes in bead ornaments.While there is no evidence of fillings,the researchers believe something was used to plug the holes because some of them were bored deep into the teeth.What that filler substance was is unknown.The holes ranged in depth from a shallow half-a-millimeter to 3.5 millimeters,deep enough to pierce the enamel and enter the sensitive dentin.The researchers have yet to find evidence of dental fillings.However they think that some sort of tar like material or soft vegetable matter was stuffed into the tooth cavity.None of the individuals with drilled teeth appears to have come from a special tomb or sanctuary,indicating that the oral health care they received was available to anyone in the society.Though the dental manipulation lasted near Mehrgarh for about 1,500 years,this 1,500-year-long tradition of drill work appears not to have been passed down to later cultures.There is no evidence that the Chalcolithic, or Copper Age, people who next lived there ever visited the dentist.Why the practice came to a halt is not known.We have no idea why it stopped.Perhaps the pain caused the practice to lose popularity. 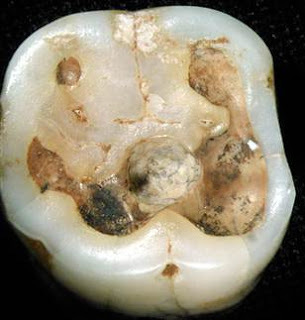 This image, released by Nature, shows a drilled molar crown from a Neolithic graveyard in Pakistan.A hole about a tenth of an inch (2.6 millimeters) wide was drilled in the center of the crown.The hole shows smoothing,indicating it was drilled well before the death of the individual.The team that carried out the work say close examination of the teeth shows the tool was "surprisingly effective" at removing rotting dental tissue.That means dentistry is at least 4,000 years older than first thought-and far older than the useful invention of anesthesia. Diseases are the bane of humankind ever since its advent on this planet.Humans have been fighting against a variety of diseases since prehistoric times.Eventually humans developed indigenous local systems of medicine.However,other than dental surgery,We could not find what kind of medicine the indus people practiced,but since we have no texts,no documents of any kind pertaining to this subject,We can only merely guess that their medicine must have been similar to that of other people who were civilized in the third millennium BC,with whom they had trade relations-that is,a combination of religious,magical & empirical rites & procedures.Amulets were worn to protect the owner against evil,hence also against disease,and like all peoples,the inhabitants of the Indus Valley must have known drugs & house remedies with which to treat the sick.The evidence for this existence of a medicine system can probably be traced from the archaeological remains of Harappa and Mohenjodaro.The Harappan people used plant drugs,animal products and minerals. 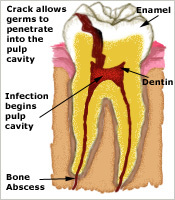 Silajit (shilajit/black asphaltum],a black thick,sticky tar-like substance,has been found in excavation,which indicates that it might have been used by the Indus people.This has several benefits,including increased energy,improved quality of life,allergy relief,diabetes relief,etc.Similarly Substances like cuttlebone [cuttlefish bone,commonly used in the treatments of gastritis etc], & staghorn were also found there.These have been used in Indian medicine today and it is quite possible that they were used as drugs in remote antiquity too.While we cannot do more than speculate in this matter on the basis of antiquity with contemporary and related civilizations,We stand on firm ground when we look at another aspect of the Indus civilizations,one which has a profound influence on the people's health,namely the construction and sanitation of their cities.